Home » News » We don’t build hope, we build futures! We don’t build hope, we build futures! Inspired by the plight of children at one of Bangkok’s biggest orphanages, Volker Capito decided to bring them just a little joy. He started with a simple objective – give each and every one of the 2,446 orphans a taste of happiness: an ice cream treat. 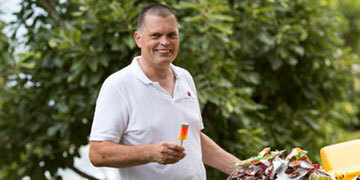 Their joy at this simple pleasure changed his life and he created the Iceman Charity. After more than decade the Iceman Charity and their sponsors are one of the pillars for the lifestyle of 2.400 children in need. The intension was never just a money sponsorship but helping the orphans with concepts to increase their standard of living. One of the major concepts is the Health- & Cleanness project. In cooperation with the GTCC and their members we would like to support the orphanage with a new ride-on scrubber machine for their 2000sqm canteen.